Brown chicken on both sides, about 5 minutes, working in batches, if needed. Remove chicken from pan and set aside. Add onion, carrots and celery to pan. Cook over medium heat until softened, about 3 minutes. Add garlic, thyme and oregano; cook 2 minutes, stirring frequently. Stir in tomatoes and tomato paste. Add broth; bring to a boil; reduce heat and simmer 3 minutes. Return chicken to pan. Cover and simmer on low heat 25 minutes or until chicken is no longer pink inside (165 degrees F internal temperature). If desired, remove chicken from pan and simmer sauce on high heat for a few minutes until slightly thickened. 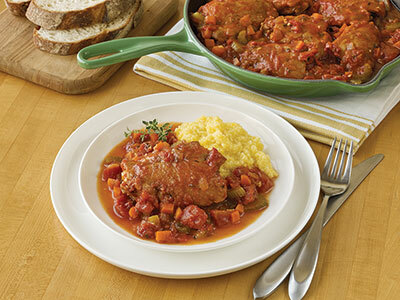 Serve over polenta, pasta or mashed potatoes.